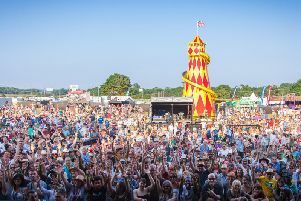 Festival fans from Sussex will be joining the thousands of people heading across the Solent for this year’s Isle of Wight Festival. Fleetwood Mac were snapped up as this year’s Festival headliners after recommendations they play it from their rock star friends. The megastars are closing the event – which kicks off tonight – on Sunday in what is a worldwide festival exclusive. The show will see original member Christine McVie back in the fold after she left the 100m album-selling act in 1998. Tens of thousands of people will make their way to Portsmouth today and tomorrow as music fans converge on Newport for the 14th festival since it was revived in 2002. The Black Keys and The Prodigy are scheduled to play tomorrow, while Blur and Pharrell Williams perform on Saturday. Festival organiser John Giddings said: “I’ve been talking to Fleetwood Mac about doing it for about five years. “But in the end it was a result of all worlds colliding. Christine was back in the group, they were doing a tour, and I know they weren’t keen on playing outdoors, but Tom Petty and Kings of Leon, who’ve both played here, told them it was a great festival. “I haven’t seen them since Christine’s been back, so I’m very excited as well. The helicopter pad is ready and waiting for them. As always the weather is high on the agenda too. Some previous years have seen festival-goers sunburnt, while others left the campsite resembling a water-logged disaster zone. And he’s excited about the other big acts on the bill too. “We’ve had The Prodigy here twice before, they’re real festival favourites – they tore the place apart when they played. As always the festival prides itself on breaking newer acts too. “There are loads of bands I want to see – The Struts, Kodaline, Coasts, Pretty Vicious, Foxes.